Hurricane Lester continues to march to the west and NASA-NOAA's Suomi NPP satellite saw the storm as it was crossing from the Eastern Pacific to the Central Pacific Ocean and triggered new hurricane watches for Hawaii. When a tropical cyclone crosses the 140 degree west longitude line, it has moved into the Central Pacific Ocean and warnings on the system will be issued by NOAA's Central Pacific Hurricane Center (CPHC). On Aug. 31 at 6:50 p.m. EDT (22:50 UTC) the Visible Infrared Imaging Radiometer Suite (VIIRS) instrument aboard NASA-NOAA's Suomi NPP satellite provided a visible image of Hurricane Lester. Lester's eye was still visible although some high clouds had filtered into it. The VIIRS image showed that Lester's eye was surrounded by powerful thunderstorms. By 11 p.m. EDT, Lester had crossed into the Central Pacific Ocean basin. On Sept. 1, NOAA's CPHC noted that a Hurricane Watch is in effect for Hawaii County, Maui County including the islands of Maui Molokai Lanai and Kahoolawe. CPHC said that hurricane conditions are possible over Hawaii and Maui counties Saturday, Sept. 3. Ocean swells generated by Lester will start to build over east facing shores today and Friday. Surf will peak this weekend, becoming very large and damaging along east facing shores. Heavy rains associated with Lester may reach Hawaii and Maui counties on Saturday, and may affect other Hawaiian Islands later Saturday and Sunday. At 11 a.m. EDT (5 a.m. HST/1500 UTC, the center of Hurricane Lester was located near 18.4 degrees north latitude and 143.7 west longitude. 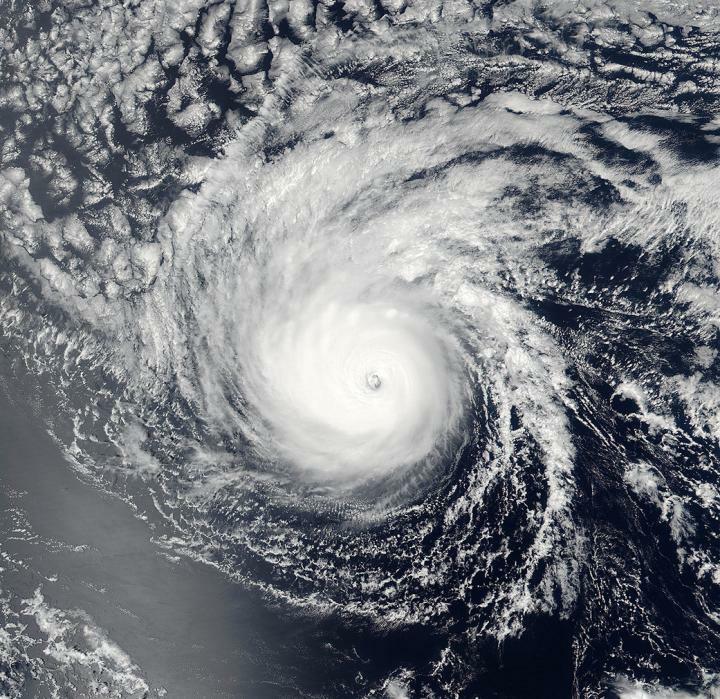 That puts Lester's eye about 750 miles (1,205 km) east of Hilo, Hawaii, and 945 miles (1,520 km) east of Honolulu. The estimated minimum central pressure is 971 millibars. Lester is moving toward the west near 14 mph (22 km/h) and this motion is expected to become west northwest later today through early Saturday, Sept. 3. Maximum sustained winds are near 105 mph (165 kph) with higher gusts. Some weakening is forecast through early Saturday.